One of the main reasons I come across for missing a workout is “life gets in the way”. While often a legitimate excuse, how quickly you are able to get back into your regular routine is of the utmost importance. I unfortunately found myself in this situation this week and was forced to miss my Week 4, Day 1 of my TRX Force 12 Week Challenge. To get back on schedule as quickly as possible, I decided to complete the Week 4, Day 1 & Day 2 workouts back-to-back, on the same day. Doubling the length and intensity of my workout would provide a new challenge for ensuring optimal energy levels. I began the day with an apple and followed up with a breakfast that included Vega Performance Protein Powder mixed in with home made cereal, as well as Chia Pudding made with Vega One Vanilla Chai. After allowing that meal to properly digest, I primed my workout by taking the Lemon Lime Pre-Workout Energizer 20 minutes before beginning. I ensured optimal hydration during my extended workout by mixing 1 Lemon Lime Electrolyte Hydrator with 250ml of purified water. After completing the first half of my workout, I attempted to re-fuel for the second half of my workout with a product that was new to me, the Vega Endurance Bar (Acai Berry). 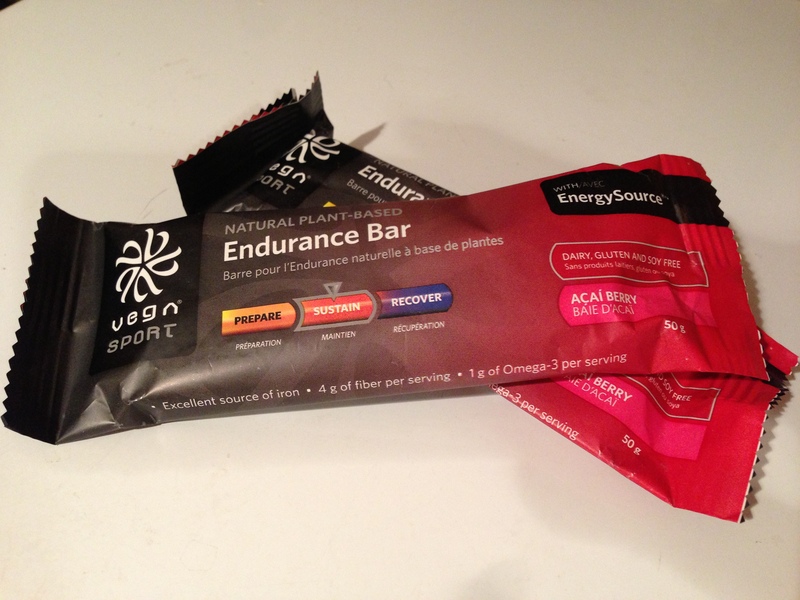 On the Vega website, I learned that the Endurance Bar “was formulated to provide instant and sustained energy during workouts. An excellent source of iron, Endurance Bar features an ideal combination of energizing complex carbohydrates and a blend of protein to give you longer-burning energy to get you through the toughest workouts, and also includes 1 gram of Omega 3s per bar”. I found the bar to taste quite good, and was surprised at how quickly the bar seemed to fully digest. Within 10 minutes of consuming the bar, I felt ready to re-start my workout and confident that my fuel levels were restored. During the second half of the workout, I felt no indigestion or cramping (quite often a sign of exercising too soon after eating), and was able to complete my back-to-back workout with a high level of intensity. Following my workout, I immediately began my recovery process by consuming the Vega Recovery Accelerator (Tropical) while finishing my workout with some light stretching. At this time, I also took 2 capsules of Vega’s MacaSure to ensure my adrenals would be properly nourished. Approximately an hour later, I ensured my muscles continued to strengthen and regenerate by eating a Vega Sport Protein Bar. As always, I chose Chocolate Coconut. While there are numerous ways to ensure your body receives the proper nutrients to fuel for, and recover from an extended workout, the ability to consume all-natural sport supplements certainly makes this process more convenient.